Bitcoin Dark is a full node implementation of Bitcoin written in the super fast to execute Go programming language. The project is in beta state and has been in development since 2013. Bitcoin dark uses the same rules as Bitcoin to validate blocks and serve a blockchain that is not forked from Bitcoin, all Bitcoin dark code passes the unit tests from Bitcoin core code. The twist with Bitcoin Dark is that it's simply a full node implementation and does not provide wallet functionality, by design. So this means you cannot actually perform a transaction directly with BTCD, for that you use btcwallet and Paymetheus (Win only) both of which are also under active development. 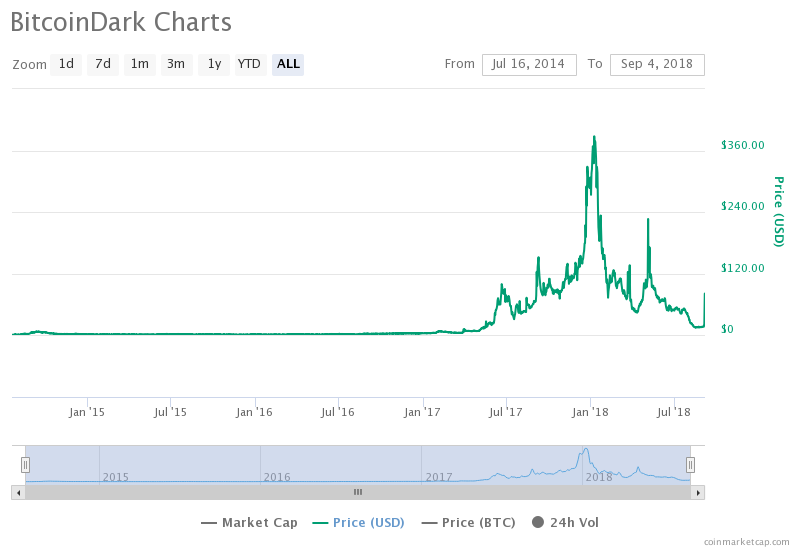 Prices reached a ATH (All time high) in the start of the year, with prices reaching highs of $360 bouyed up by Bitcoin's bull run. With a recovery starting now, the next targets would be $120 to $230 to see if BTCD can make back it's gains from earlier in the year. With the last tweet in May, the bitcoindark.com domain offline - and the Bitcoin dark official slack not publically open. There is little to go on why approximately half a million USD has moved into the BTCD market over the last 24 hours. We will continue to follow BTCD to see what commits and pull requests follow in coming days, currently there are many PRs open with loads of bug fixes and feature improvements. The future is definately looking interesting for BTCD.